This little combo shocked us into submission; we can't get over how incredible it sounds and how perfectly suited it is for its intended players. Fabulous clean tones with great headroom and power. Fine build. Footswitchable reverb would be nice. That price is hard to ignore. Despite being small in size, this combo packs an impressive punch. The finish on the amp looks wonderful. The build quality is top-drawer, as you'd expect at this price. Both amps have a pull bright function on the treble control. 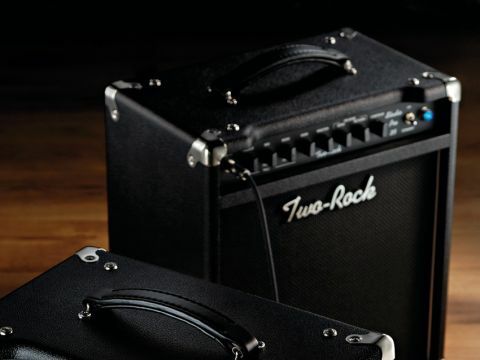 This amp and its sibling, the Gain Master 22, are part of a recent range of lower-powered heads and combos from Californian amp maker Two-Rock, which began with 2005's Jet. While there are enough similarities to question the point of three products that seem to overlap, Two-Rock insists they are wholly different beasts. "The Jet followed the lineage of the Custom Reverb Signature and is a self- contained 'grab and go'," the company's general manager Mac Skinner tells us. "With no pedals the Studio Pro is huge and clear, delivering tones that chime with super clarity." "Where the Studio Pro needs pedals for overdrive, the Jet can do that. The Jet has a different clean circuit than Studio Pro. Tonally they are all different. The Gain Master was designed to be a lower wattage, dual-channel, classic amp design, modelled after our limited edition TS-1." The cabinets are constructed from finger-jointed Baltic birch, ensuring stability and strength. Their small size lends the amps the stated 'grab and go' vibe. "We experimented with larger designs, but after countless prototypes we settled on the current combo cab, tuned perfectly to the size of the amp," says Skinner. The model centres around point-to-point manufacture. "We don't use PCB boards in our preamp or power sections," says Skinner, "and we use only the finest quality parts available. Most of our capacitors on the preamp board are manufactured for us to our specifications. "Every amp we produce is made in-house by a team of skilled and dedicated amp builders. Take a look inside one of the amps, you'll see the quality I'm talking about." He's not wrong; sliding out the amp tray reveals a lesson in elegant design and manufacture. Finish is similarly impressive elsewhere; a beautifully fitted Tolex covering, comfortable leather handle, chrome corners all round, large rubber feet and neatly recessed front panel. A rear baffle protects the tubes and speakers, and removing the seven screws to get at the inside will take just a few minutes if a valve change is needed. The 6L6-driven Studio Pro 35 is a single-channel amp whose front panel features input, three-band EQ (pull boost pots on each), gain, master volume, reverb send and return pots, contour, standby/on and jewel light. It sounds simple, but delve deeper and things get sophisticated. The input features a rear-mounted 'pickup loading' control, the idea being to match single-coils or humbuckers to the amp. More loading (position one) means controlled response and lower gain, while the remaining four positions gradually reduce loading for a more aggressive tone. Reverb offers an unusual nuance, too: a send and return loop. "It's designed to be a wet/dry mix," Skinner explains; send is the amount of signal going to the reverb tank, and return is the signal coming back. This gives a lot of control over the reverb and its characteristics." Also on the rear panel is an active buffered effects loop with return level control, power on/ off and fuse holder. The amp's dribers are the 12-65B made by Warehouse Guitar Speakers. "We have found it to be a perfect match to the smaller amps," states Skinner. Other speakers are available as extra cost upgrades: namely, Eminence's TR12-65 or a Celestion G12-65, the latter of which "sounds amazing" according to Mac. At 35 watts, our Studio Pro is massively deceptive in what it delivers. With no pedals it's huge and clear, delivering tones that chime with super clarity. There's so much headroom it's almost unbelievable. With a Strat's neck pickup it's instant Hendrix/Mayer/Vaughan - plummy bass and shimmering trebles; dynamic and utterly musical. Using the gain and master, drive can be coaxed from the amp but our best results came by tweaking them to find the sweet spot just before natural overdrive occurs, and plugging in our favourite pedals. Adjusting the contour pot above its centre 'flat' position increases highs and diminishes lows, while decreasing it has the opposite effect. We liked it set at around 12 o'clock, although certain rooms or instruments might prompt you to tweak things a little bit. Reverb send and return controls let you adjust how the effect interacts with the amp. Spending time with it can elicit anything from mild ambience to dark and thunderous caverns! It's a shame it's not footswitchable though, as it would be great to bring it in as a specific effect here and there. We used the amp at pub gigs and it roars. Two choice stompboxes up front - Fulltone Full Drive 2 and Providence SOV-2 in our case - used either singly or together can create phenomenal sounds. It proves that if you start with the best clean tone you can find, add drive from quality pedals and play dynamically, you'll be rewarded with everything you've ever wanted from an amp. What you put in is what comes out, but somehow better than you've heard it before! Over two grand for a low-wattage 1 x 12 combo without many bells and whistles is a lot of dough in anyone's book. Can it ever be justified? Let's answer that with another question: how much are you prepared to pay for the best tone you may ever have? This reviewer has himself forked out for a Two-Rock, so perhaps there's your answer. Please don't be deceived by its size and wattage. We've never heard such a huge sound coming from such a tiny box; it's as though Two-Rock has performed some kind of magic trick that we've yet to uncover. The difficulty is actually keeping the volume down. The headroom is unbelievable, and everything starts to 'happen' at just the right level. If you're a player who wants huge headroom with giant cleans that exude warmth and sparkle, then go for the Studio Pro 35 - especially if you know how to get the most out of your pedals. This amp has been a revelation. Its bang per watt ratio is staggering, but it's the glorious clean tones and singing leads that impress us the most. If you're in the market for a quality amp, you simply must try it. Like someone not a million miles from here, your wallet might go home a couple of grand lighter!